Frosty Friends is Hallmark's longest running and arguably most popular series. It features a friendly Eskimo and his pals. 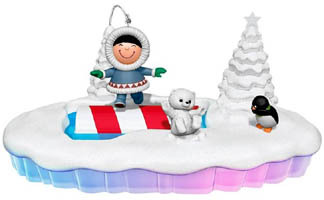 The series began in 1980 with an ornament called "A Cool Yule" - this ornament was featured again in 2006. 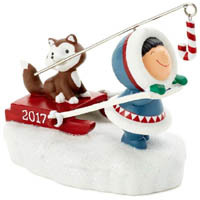 The original design was "repainted" for the 2006 October Ornament Debut. Quantity - 3 2016 "Swing In The Holidays"